EXCLUSIVE / The European Commission’s new Circular Economy Package will create 110,000 fewer jobs in the United Kingdom, Germany, Poland and Italy than the axed bill it has replaced, according to research obtained by EURACTIV. The Green Alliance said the lower targets and less ambitious approach in the new package would create fewer jobs than its 2014 predecessor, which was ditched under the Commission’s drive for “better regulation” and less red tape. In Germany alone, this will mean spending about €740 million more in unemployment benefits each year by 2030, the London-based environmental think tank added. EURACTIV reported last week that leaked drafts of the new package – due to be officially launched in Brussels today (2 December) – had lower recycling and landfill targets than its predecessor. The 2014 package called for a 70% recycling target for municipal waste for 2030, and a total ban on landfill for all recoverable and reusable waste.But leaked drafts of the package, which are subject to change ahead of today’s launch, only call for a 65% recycling goal, and will allow a 10% landfill quota. Deadlines to hit targets are extended for some countries, targets to reduce food waste and boost resource efficiency have been dropped, and language softened on the collection of bio-waste. “A more ambitious package than the one proposed in 2014 could create around 335,000 net new jobs in Italy, Poland, Germany and the UK, but reduced targets and lower ambition could mean that 110,000 fewer net new jobs are created,” said Dustin Benton of the Green Alliance. Commission First Vice-President Frans Timmermans promised the European Parliament that the new package would be “more ambitious” than the old one after controversially ditching it in December last year. “Give me the chance to prove you wrong,” Timmermans asked Green MEPs, after pressing ahead with the decision to drop the package in the face of European Parliament opposition and EU environment ministers. The original Circular Economy Package was drafted under the previous Barroso Commission, which said it would create €600 billion net savings, two million jobs and deliver 1% GDP growth. The Green Alliance researched how the development of the circular economy could impact the jobs market in Italy, Poland, and Germany. It focused on “net job creation”, meaning those unemployed finding work, rather than simply switching jobs. It found that in those three countries, an ambitious, developed circular economy could bring 270,000 people back into work and save €3 billion a year. Exclusively for EURACTIV, the think tank used their research model to evaluate the cost of lowering the ambition of the Circular Economy Package, based on the leaked drafts. It widened the scope of its original study to include the UK. It estimated the effects of the 2014 original package, including the impact of additional measures it called for, and ran the same analysis on the new package. Researchers found 20,000 fewer net jobs in the UK would be created under the new package (41,000 compared to 61,000). In Germany, the 2014 package would create 120,000 net jobs, 46,000 more than under the new package. In Italy 58,000 people would be brought back to work under the new package, 30,000 less than under the original axed bill. Polish unemployment figures will be dented by 51,000 under the new package, but that is 16,000 fewer than would have been created if the original rules had been implemented. Today’s launch of the retabled package is a first step. Before it becomes law, the Council of Ministers and European Parliament must agree an identical text. “The good news is that both the Council and Parliament can increase the ambition of the package, and therefore the benefits, when they negotiate over targets and policy measures early next year, ” added Benton, who is head of energy and resources at the Green Alliance. The Better Regulation Agenda is the Commission’s strategy to cut red tape but it has been dogged by accusation it masks a pro-business agenda that drives down environmental standards. EURACTIV exclusively revealed in November 2014, that lobby organisation BusinessEurope had written to Timmermans before the decision to wield the axe was taken. It asked for the Circular Economy Package to be killed off and replaced with a more economically driven package. The European Commission has a policy of never commenting on leaks. The Circular Economy package was intended to increase recycling levels and tighten rules on incineration and landfill. It consists of six bills on waste, packaging, landfill, end of life vehicles, batteries and accumulators, and waste electronic equipment. 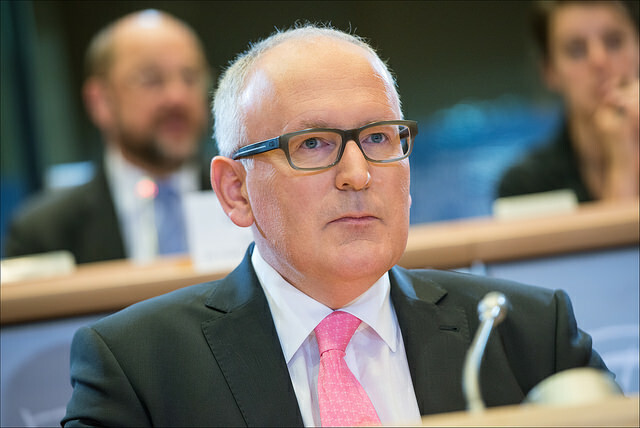 European Commission First Vice-President Frans Timmermans was given a mandate from President Jean-Claude Juncker to cut red tape and deliver “better regulation”. Better regulation is an EU reform that the UK government has demanded. He told MEPs in December that he would withdrawing and re-tabling the package, to make it "more ambitious".